Two bedroom, two bath oceanfront villa on the second floor overlooks fresh water pool, beautiful sandy beach and the Atlantic Ocean. Private island resort offers 2 1/2 miles of uncrowded, unspoiled white sand beaches. Villa is professionally decorated and delivers an elegant coastal living environment. Floor to ceiling sliding glass doors offer panoramic view of the pool, landscaped courtyard, white sand beach and the ocean. Living room / dining area have matching sofa and loveseat, dining room table and chairs for six people and a entertainment center with flat screen TV with cable reception. Master bedroom opens onto oceanfront balcony and offers king size bed, private bathroom and walk-in closet. Furnishings include triple dresser, mirror and matching night stands with lamps. Guest bedroom has one full queen size bed and a loveseat that opens to a single bed. In addition, there is a dresser and a night stand. Remodeled kitchen fully equipped with Whirlpool appliances, refrigerator with ice maker, electric range, microwave, dishwasher and all 'new' small appliances. All china, glassware, utensils and cookware are provided. Wild Dunes Resort is a master planned, gated community with 24 hour security and features two Tom Fazio designed championship golf courses. Wild Dunes has a top ranked tennis center with 17 Har-Tru courts. State of the Art Fitness Center offers personal training, aerobic classes, weight machines, free weights and massage therapy. Full service Isle of Palms Marina is within 5 minutes. Summer rentals run from Saturday to Saturday. All linens provided except for beach towels ! Three (3) Flat Screen HDTVs. Flat screen TVs in both bedrooms. Satellite / Cable service provided by Comcast XFinity. We thoroughly enjoyed our two weeks stay. The condo is nicely decorated, comfortable, with a very well-equipped kitchen. Nice views of the pool and ocean, with quick access to the expansive beach. 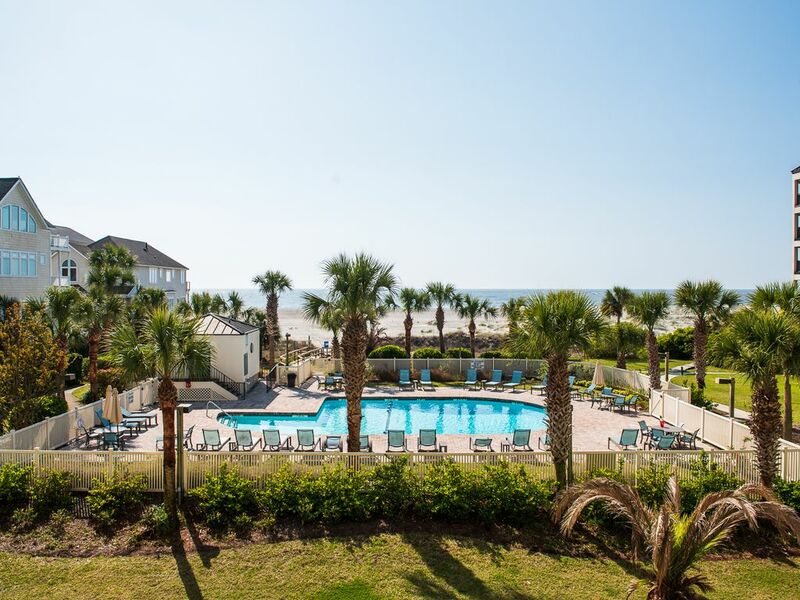 The location within the Wild Dunes Resort is excellent. We began every day with a long walk on the beach, and spent many hours searching for shells. The weather during our stay was exceptional. We would highly recommend this property and plan to someday return. Excellent Choice ! Great view of the Atlantic Ocean ! Great oceanfront property in Wild Dunes ! Beautifully maintained, very well decorated and housekeeping was excellent ! Would highly recommend this property for a family vacation ! This 2 bedroom condo overlooked the pool, with a view of the ocean in the distance. It’s nicely furnished with up to date decor and a well stocked kitchen. We rented a boat, visited Charleston, and enjoyed delicious food at nearby restaurants. The beach is beautiful. We’re glad we remembered to bring beach towels. Our only regret was having to leave. We’d love to go back! We thoroughly enjoyed our stay on Isle of Palms at this lovely condo. We had everything we needed for our stay: cookware, Tupperware, ice, etc., in this clean, comfortable home for a week. We enjoyed the pool everyday and walks on the beach every morning and afternoon! Very relaxing and refreshing. Wild Dunes Resort is a master planned, gated community with 24 hour security and features two Tom Fazio designed championship golf courses. Wild Dunes has a top ranked tennis center with 17 Har-Tru courts. State of the Art Fitness Center offers personal training, aerobic classes, weight machines, free weights and massage therapy. Full service Isle of Palms Marina is within 5 minutes. Rate quoted is all inclusive, no additional taxes or fees.